A day-by-day planner for must-see, must-do attractions at this year's fair. The State Fair of Texas: We know that some of you go for the sole purpose of stuffing your maw with assorted (and ingenious) fried concoctions. We understand and applaud that, but we don’t want you to miss out on all the other fun things to do at this annual festival in Dallas’ Fair Park. To that end, we’ve culled all 24 days’ worth of activities for the most noteworthy things to see and do and fashioned them into this handy guide. Examine it, print it, commit it to memory—and rest assured you’re going to maximize your fair experience. My money's on the guy in the smart purple-and-yellow cloak. Milking Parlor Demos. Watch cows from local farms demonstrate modern milking procedures. 11 a.m., 12:30, 2:30, 3:30, 4:30, 5:30, and 6:30 p.m. Pan Am Barn. State Fair of Texas Wine Garden. Enjoy wine by the glass and wine-paired snacks daily, plus jazz on the weekends. 10 a.m. to 10 p.m, Fridays through Mondays, and from 10 a.m. to 9 p.m. Tuesdays through Thursdays. The Texas Skyway. Can’t decide where to eat, what to ride, or whom to see onstage? This 1,800-foot aerial track is a great way to scope out the fairgrounds. United States Marine Drum and Bugle Corp. Catch these guys, who came all the way from Washington, D.C., every afternoon from Sept. 24 to Oct. 11 at Marine Corps Square, as well as each night during the evening parade. Russian Bar Trio. Afraid of heights? These folks aren’t. Using only a pole, acrobats on the floor coordinate their moves with the trio’s aerial “flyer.” 1, 2, and 3 p.m. daily, plus noon shows on Saturday and Sunday. Marine Corps Square. 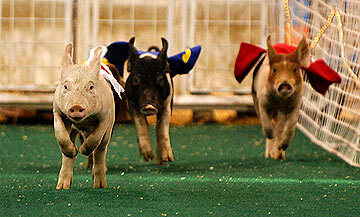 Pig Races. Three times a night, visitors can “wager” on these darling creatures as they trundle down the pike. Pan American Arena. 6, 6:45, 7:45 p.m. Pan Am Arena. Illumination Sensation. This nightly show—likely to leave the kids (and some of their parents) with mouths agape—features lights, water, music, and fireworks. 8 p.m. Esplanade reflecting pool. Startex Power Starlight Parade. We love a parade, particularly one with lighted floats, drum and bugle players from the U.S. Marine Corps, and giant puppets. 7:15 p.m. The Pirates of the Caribbean Dive Show. Athletes dressed in pirate costumes splash and stun the crowd with this thrice-daily comedic stunt show. Noon, 2 and 4 p.m., plus a 6 p.m. show Saturdays and Sundays. In Gateway Plaza. Jump! Ultimate Dog Show. If you love dogs, you’ll want to check out this show demonstrating canine skills and agility at least once. 11 a.m., noon, 1 and 2 p.m. Pan Am Arena. Opening Day Parade. C’mon. You’re likely to be downtown at lunchtime anyway. Why not tote your meal-replacement bar outside and help usher in the fair season? Noon. Downtown Dallas. Opening Day Ceremony. The fair will never have as much energy as it does tonight, so make sure you take it all in during this celebration. 7 p.m. Hall of State Steps. Glue a Shoe Contest. Have you ever looked at one of your shoes and thought, “Gee, dab a little metallic paint here and there, and that would make a really neat submarine” but then you didn’t follow through because there wasn’t any prize money involved? WELL, today is your lucky day. The top three Glue a Shoe contest entries will win $10, $8, or $5 prizes. Categories include boot, high-heeled shoe, sandal, tennis shoe, and flip-flop or loafer. Compete in just one or all five, but only one shoe per class will be accepted. Entries accepted at 9 a.m., judging at 10:30 a.m. Contest Kitchen, Creative Arts Department. Nigerian Dwarf Goats Local Club Show. We’ve been able to ascertain that this show involves very small goats, and really, that’s all we need to know. See ’ya there! 9 a.m., Swine Arena. Mat Kearney. 8:30 p.m. Chevrolet Main Stage. Click here to download the complete calendar for Sept. 24.